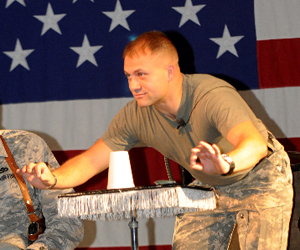 When MAGIC columnist Joanie Spina learned of Chief Warrant Office William Scott Anderson and his magic performances in Iraq and Afghanistan, she was so taken that she wrote a feature story on him for the March issue of the magazine. She also created a YouTube video/slideshow of Anderson's work for the troops and civilians, which can be seen on the MAGICwebsite. Joanie also sent it to a TV producer friend. As a result, Anderson was interviewed by NBC's Michelle Kosinsky in Oregon on Friday. Barring any major news event bumping the story, the magician will be featured in NBC's "Making A Difference" segment on Tuesday evening. Broadcast times vary by time zones and markets.